Hot water heaters make our everyday lives convenient and comfortable. Imagine how a cold shower would make you feel on a frosty January morning, or the cleanup after a large meal without the use of an automatic dishwasher; not to mention your white linens and clothes, which are best cleaned in hot water. It’s hard to see what the modern home would be like without an excellent water heater at your beck and call. We offer excellent water heater services throughout the Coeur d’Alene, ID area, whether you need a new system installed from scratch or your existing system repaired or maintained. 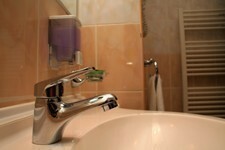 We offer both tank and tankless systems. When it comes to your hot water, make sure you hire a professional water heater technician to get the job done right the first time. The hot water heater is a large and complicated machine that requires the technical expertise and experience of a trained professional. That’s the only type we employ here at ACI Northwest. Since 1992, we have had a very straightforward task: to bring customer satisfaction to a new level by ensuring that our customers enjoy an unprecedented level of comfort and convenience. Let us know what we can do for you regarding water heater service. Call ACI Northwest today for quality water heaters and excellent water heater services in Coeur d’Alene, ID and Spokane, WA. There are a range of options in Coeur d’Alene, ID when it comes to water heaters, and you can find additional details on each of these systems on this website. The most common fuels used by hot water heaters are natural gas and electricity. We install and service both electric water heaters as well as gas water heaters. Additionally, you can choose from tank or tankless water heaters, as well as whole home versus point–of–use water heaters. When looking at the hot water heater options, some additional details to consider are its capacity, dimensions, and the energy–efficiency of the water heater. Do you need Professional Water Heater Service in Coeur d’Alene, ID or Spokane, WA? ACI Northwest is a licensed water heater service company that has years of experience working with all types of hot water heaters. Our expertise spans across every imaginable water heating system, whether a tank water heater, tankless water heater, whole house water heater, or point of use water heater. It doesn’t matter if your hot water heater is new or old, big or small. We can ensure that it is properly serviced the first time around. When it comes to water heater installation, you need to hire a professional to ensure that your new equipment matches the size of your home as well as your hot water needs. We work with homes and budgets of all sizes, and we can certainly find a hot water heater for you. If you notice that your water heater no longer functions as it once did, it requires frequent and costly repairs, or it has broken down completely, then you may want to consider professional water heater replacement. We can make sure that your equipment is carefully removed and that you find a new model to your liking. If you own a hot water heater and use it frequently, it will break down eventually. There’s no way around it. Keep an eye out for signs that your water heater is not working correctly, such as high energy bills and inadequate performance. We can provide excellent water heater repair at a moment’s notice. Keeping your hot water heater in good working order is easy when you work with the professionals at ACI Northwest. Our water heater maintenance service is excellent, and we can make certain that your system is professionally cleaned and adjusted. If you want a reliable, budget–friendly hot water heater for your home, then look no further than a tank water heater. We offer excellent tank water heater services, including installation, replacement, repair and maintenance. Let us provide a water heater service for you. If you’re looking for something a bit more energy efficient than standard tank water heaters, then you may want to go tankless. These systems heat your water on–demand in order to ensure that you only heat the water that you use, thus reducing standby energy loss and promoting efficiency. Call ACI Northwest to learn more about the water heater services we offer throughout Coeur d’Alene, ID and Spokane, WA.